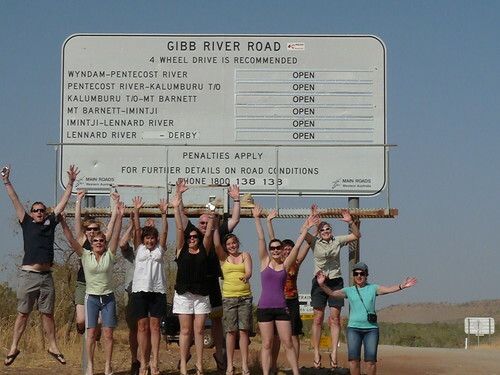 You are currently browsing the tag archive for the ‘Fitzroy Crossing’ tag. After a two-hour, bone-jarring trip from the heart of the Bungle Bungles, we reconnect with the Great Northern highway for our long journey back to Broome, the end of a 2500 km loop. We are still roughly 700 kms (437 miles) away and there are only two towns of any size along the way– Halls Creek and Fitzroy Crossing. Both towns may have a combined population of 3,000 people on a good day. The bitumen (asphalt) is bliss, and Anthony takes the opportunity to pop a movie into the DVD player and turn on the neglected LCD. We have time to see “Australia” in its entirety. It is my second viewing of the blockbuster, and my perception has been altered by an appreciation for the landscape around me. In the film, the cattle station of Faraway Downs is supposed to be located in the Kimberley, so much of the footage was shot in this spectacular country. It was a plagued and expensive shoot; the principal photography alone took nine months. The plot has bits and pieces of nearly every genre film in the history of Hollywood, (with the persecution of Aboriginals and the “stolen generations” thrown in), but I’m glad I got the chance to see it with new eyes. Halls Creek was initially a gold mining town, named after Charles Hall who found the alluvial gold that led to the Kimberley gold rush in 1885. The gold never amounted to much and it petered out fairly quickly. Today, the town is little more than a support center for remote cattle stations. We have a brief stop, but our destination for the evening is Fitzroy Crossing. 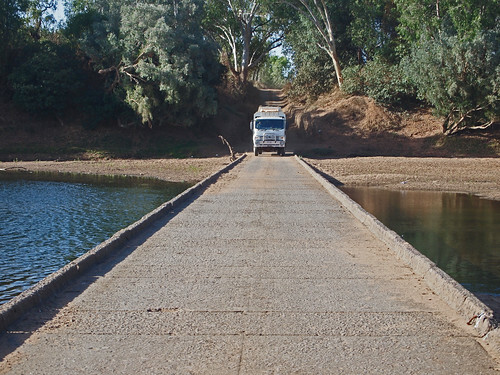 Our timing at the end of the dry season allows us to use the old crossing, which has been replaced by a new bridge. The old concrete has been inundated by up to 13 meters (42 feet) of water on occasion, so the new bridge was more than welcome. During the rainy season, the Fitzroy is a powerful river that can swell over its banks, with more than 98 million cubic meters of water flowing past the town each hour. With that much water, you could fill Sydney Harbour in five hours. 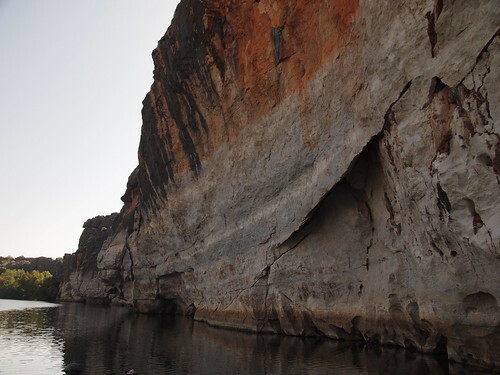 Our last treat on the trip is a boat tour on the river itself– up through Geikie Gorge, soon to be renamed Darngku Gorge. Its high, limestone cliffs are part of an ancient Devonian reef, identical to the Napier Range. Our journey has taken us back to an area not far from where we had our first walk among the rocks– at Windjana Gorge and Tunnel Creek. As the ocean floor slowly subsided over the 50 million years of the Devonian period, the reef-building organisms built up and up until, in places, the reef became more than two kilometers thick. The high water mark is visible in the photo below. Our stop at the Willare Bridge Roadhouse on the way to Broome seems anticlimactic. What seemed interesting and uniquely “outback” a mere eight days ago now seems shabby. Man’s architectural offering in this landscape is sad when measured against the beauty we have seen on our tour through the Kimberley. But there is ice cream, and we all enjoy it very much. Our eight-day trip has been too short to get more than a cursory view of this fragile part of our planet. I would love to see it during the “wet.” I could easily spend a month or more under the spectacular canopy of stars, wandering into ancient stone gorges, swimming under rock precipices, feeling very small. I am grateful to have shared the experience with a dozen generous strangers. I’m glad that they were predominately Australians. It will soon be time for quick good-byes and the long trip back home.